Charles arrived at the ceremony for Gri-Fel and Terapishimn very formally dressed – at least for a child – although it was a modest ceremony for a modest position. He got a few odd looks from the less well-informed, but he was on the guest list, and – while he was checked over by security as he entered the chamber – it VERY politely done and not at all intrusive. He… was apparently becoming known as a powerful and mysterious figure… The chamber itself had been decorated to simulate the environment around Arcosanti – and the guest list was short: Terapishim and Gri-Fel’s friends, some gods currying favors, and Pure Frothing Delight and his terrifying minions, who were enduring floating around in their master with only the occasional quack. Gri-Fel and Terapishim were meditating upon the position on a dais in the rear. Soon, their new supervisor would approach, and they would sign the contract. Who knew what changes would occur to make them more suitable for the joint position? 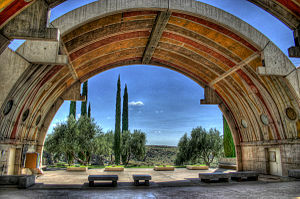 Perhaps fortunately, gods rarely changed all THAT much for a new position (it was often mostly cosmetic) – and Arcosanti was about to become far more important than it had been… If Charles had anything to say about it, it was about to become headquarters for several hundred major entities dedicated to trade, and to it’s protection and prosperity, and to the guardianship of Creation – and major gates to a dozen worlds were set up to open up in the area around it relatively soon. As the Inukami, Djinn, and other operatives set up the (mostly) underground, efficient, and ecologically-friendly rail systems, and the secondary supply and gate-defense manses, it would become the center of trade and contact for a dozen prosperous worlds and the staffs of THEIR supporting manses. With the arrival of Redstone Runner, the Region Goddess of the North American Southwest, resplendent in her elaborately woven robes of the regional rock formations, things got down to business… The contract was signed. Other than immediate and palpable relief… Gri Fel became just a bit more wooly, and Terapishim’s beard took on the fine texture of Arcosanti’s local sand. It was still very impressive though! Even the goddess admired it – and there was quiet and respectful applause. He stuck around to talk after the ceremony of course! He was well aware of what these “friends” wanted, but favors were always good to have owed! It looked very serious for a rubber ducky! After a little more socializing – with gods who were either (1) mildly confused as to why the mortal child had been invited, or (2) had heard wild rumors about that mortal child and were both curious and nervous – Charles left to visit the Bureau of Humanity to notify them of his intent to build a manse in Arcosanti. After all, gods being gods, the banquet would last at least a couple more days – which should give him plenty of time before anyone even considered the possibility that there might be anything serious going on in their new domain! A functionary at the Bureau of Humanity filed the request and told him to wait several weeks for approval. That meant that… all he needed was to get the distribution department to acknowledge receipt. It was easy enough to find one who was willing to keep her mouth shut. For each unemployed god that was on the streets, there was at least one relegated to busywork paper-pushing. Besides… a contractor wanted to save a month on a years-long project; who cared? He left with his acknowledgment/permit. He could just see it… “What’s the problem? I TOLD you I was going to and you gave me a permit… Just because you EXPECTED to have years to file objections doesn’t mean that you get them!” Still… if they complained at the poor goddess he’d have to make it up to her! Off to Arcosant and manse-making! Albeit with some extra privacy spells and things! The community, while not yet really a full city, was definitely eclectic! That nice bell-making thaumaturge was still at work, ensuring that his metalwork and ceramics sounded as beautiful as possible. Charles cheerily greeted him while picking the spot… it wasn’t like the man could somehow fail to notice the demesne upgrade and activation anyway! At least there was lots of room for the simple stone cube of the manse though; it really wasn’t all that big. He was pretty obviously expecting the standard forms of adjustment there – or perhaps a slight improvement. Charles made sure that the Coatl were ready to catch him if HE fainted. He’d always thought that was an exaggeration, but it seemed to happen a lot. Maybe it was the energy-flux overloading people for a bit? He put up a privacy ward that would keep anyone from paying any attention to this spot in one of the secondary green zones/gardens, and got to work – albeit with less drama than usual. It wasn’t like it really helped any and this would be hard enough to keep quiet already. Between the landscape tweaks and the pouring of essence into the demesne… Everyone with the slightest trace of sensitivity would feel that, even if they had no idea of what it was – and he couldn’t exactly hide the place in a pocket-dimension this time! It had to be out in the open to recruit it’s guardians! Santiago did indeed register the energy surge – and did faint (a point for “physical reaction” over “psychological” perhaps? It might just be a sign of a sensitive being overloaded by the flux…). Once he came to, a Coatl had to shut his mouth for him as he looked upon the results. The manse was only a stone cube about ten feet across – although the engraving and patterns in the stone and such made it very nicely decorative (and wonderfully well fitted into Arcosanti’s design of course). Santiago took a look – and found the information on the three oaths flooding into his mind as Charles pulled it’s rank-0 hearthstones into manifestation and collected them. That commitment… was enough to send incredible power surging through him, transforming him into a Guardian of the Bazaar. Santiago didn’t faint this time – but he was clearly NOT prepared to be enlightened like that, so quickly! It wasn’t painful… but it was still quite a shock! (Charles) “There you go! Earth can always use more protectors – and I congratulate you on making that decision! Charles gave him a couple of pairs of the upgraded life-extension bracers that shortly bestowed independent longevity. After all, he might have a family! Perhaps blessedly, he didn’t… just the explanations alone would have been a nightmare! Wait… “Earth can always use more protectors”?!?! Was this child… actually wandering around the world handing out vast powers to anyone who was… willing to commit to BEING NICE TO PEOPLE? This was the sort of thing that happened in COMIC BOOKS! Santiago found that he could indeed swap back to a normal form quite easily. Santiago – still in a slight bit of shock, but with a palpable aura of power – shook Charles’s hand… Charles left a few extra guards for the moment – just in case someone wanted to interfere with the manse before it had gathered enough guardians to make that awkward – and headed back to Yu-Shan to give the Hearthstones to Gri Fel and Terapishim and to let them know that the Manse had already recruited it’s first Guardian. Charles was very pleased! Even the old Imperial Capital might not have had so many major powers directly associated with it, although it HAD had many more lower-end Dragon-Blooded hanging about. They’d make a fine support staff as they started trickling in, and would bring in trade, and wealth, and support for the entire arcology-and-nature concept – which would be a splendid example when the planetary gates he was setting up to open near Arcosanti did so and it became an intergalactic crossroads! It would be a win-win situation for pretty much everyone! There would inevitably be conflicts and the like, but that was the risk of letting anyone run ANYTHING without constant interference and micro-management – and if Gri Fel couldn’t handle that… well, something had gone badly wrong. He might have gotten pretty corrupt at the end, but he had been excellent at what he did – and there wasn’t that much room for corruption at Arcosanti! It had a rather bright future coming up now! Shortly the Bureau of Humanity, and the Convocation on Essence Wielders, and the Masons, and various other groups, would want to talk – but that was for another time. Santiago’s new appearance is ringing some bells, but I can’t quite remember to what. Oh god that was a horrible pun. Ah, now I remember: The Silver Surfer. But with less planet destroying, and more music. Hm. I suppose that there might be some resemblance… both in appearance and in terms of power level, although THAT varies an awful lot with any comic-book character.